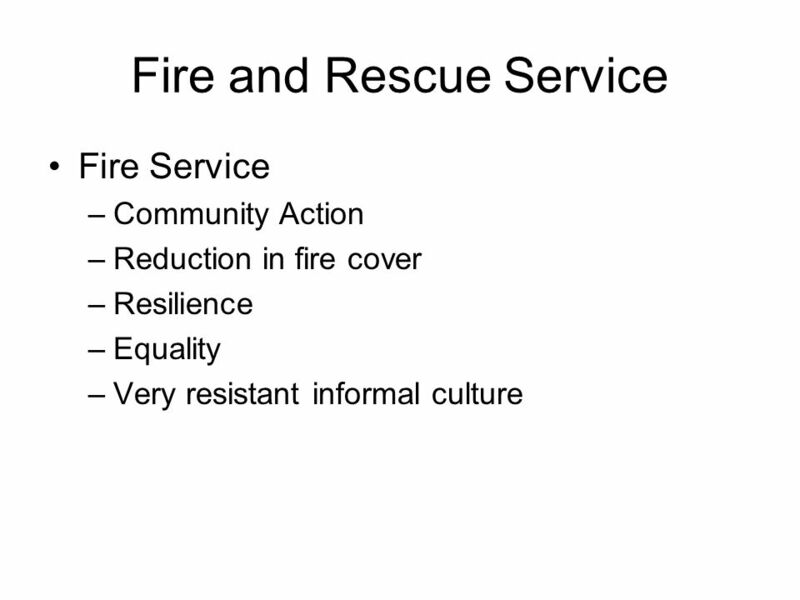 Modernisation = efficiency (Key authors Farnham and Horton) Government view is –Policing the communities –Preventing Fires and Accidents –Professionalising. 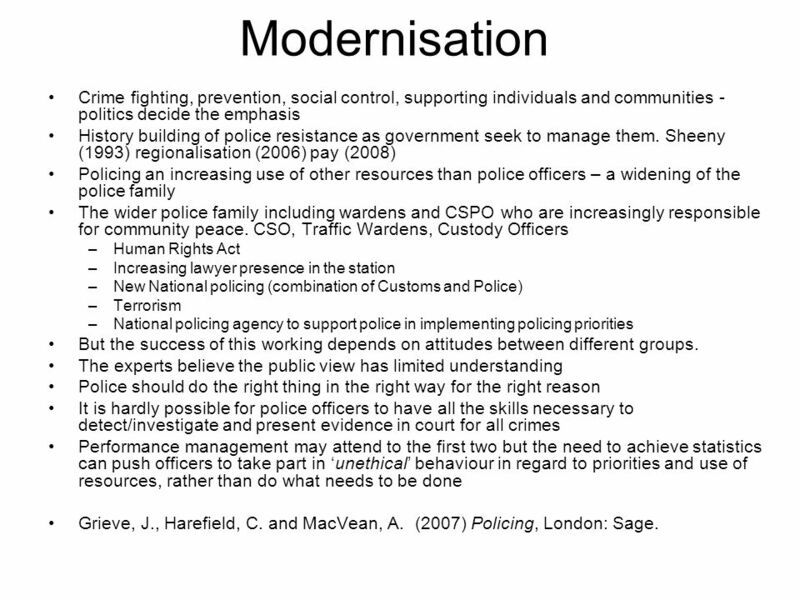 6 Modernisation Crime fighting, prevention, social control, supporting individuals and communities - politics decide the emphasis History building of police resistance as government seek to manage them. 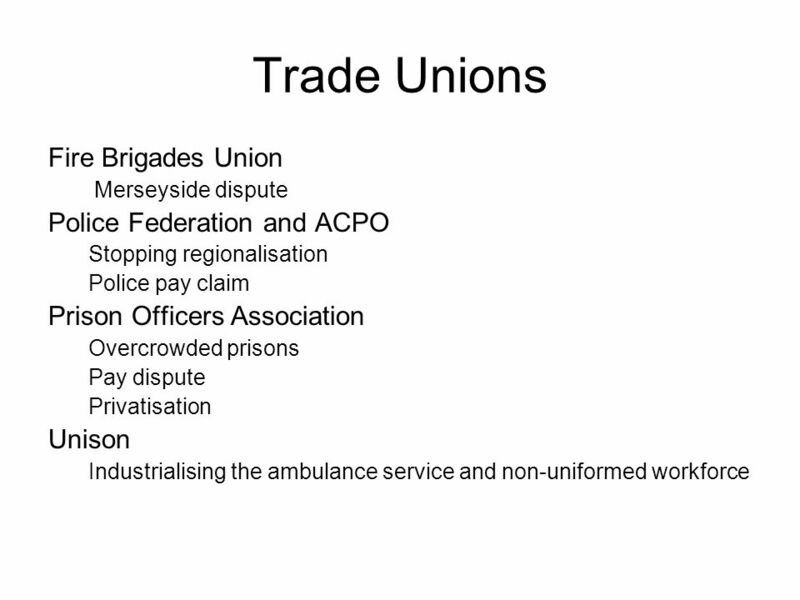 Sheeny (1993) regionalisation (2006) pay (2008) Policing an increasing use of other resources than police officers – a widening of the police family The wider police family including wardens and CSPO who are increasingly responsible for community peace. CSO, Traffic Wardens, Custody Officers –Human Rights Act –Increasing lawyer presence in the station –New National policing (combination of Customs and Police) –Terrorism –National policing agency to support police in implementing policing priorities But the success of this working depends on attitudes between different groups. 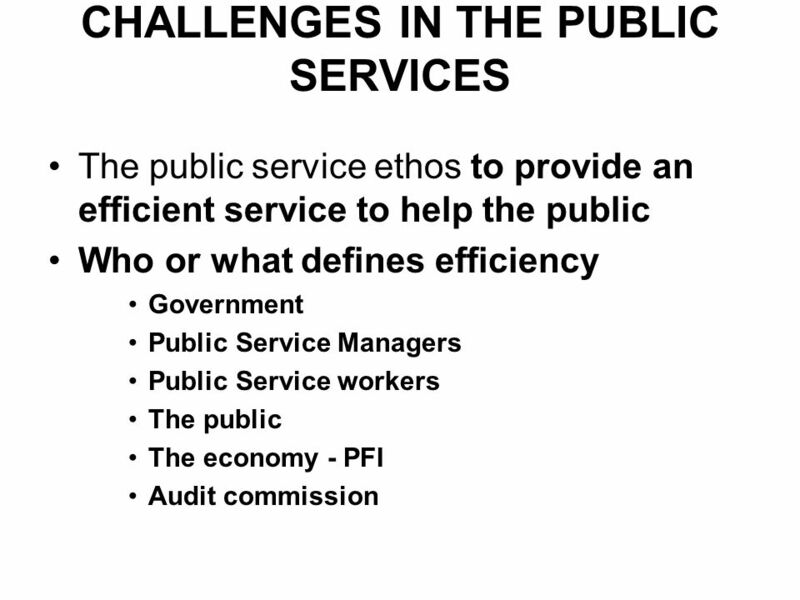 The experts believe the public view has limited understanding Police should do the right thing in the right way for the right reason It is hardly possible for police officers to have all the skills necessary to detect/investigate and present evidence in court for all crimes Performance management may attend to the first two but the need to achieve statistics can push officers to take part in unethical behaviour in regard to priorities and use of resources, rather than do what needs to be done Grieve, J., Harefield, C. and MacVean, A. 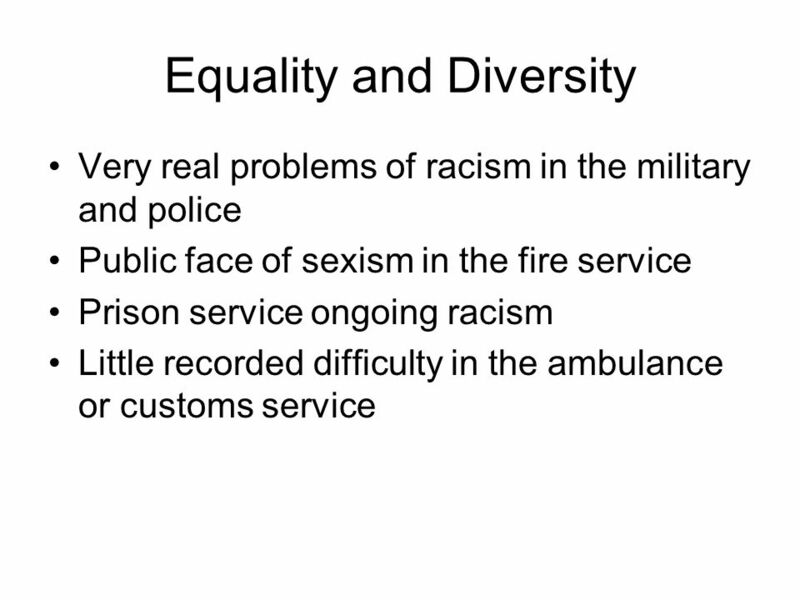 (2007) Policing, London: Sage. 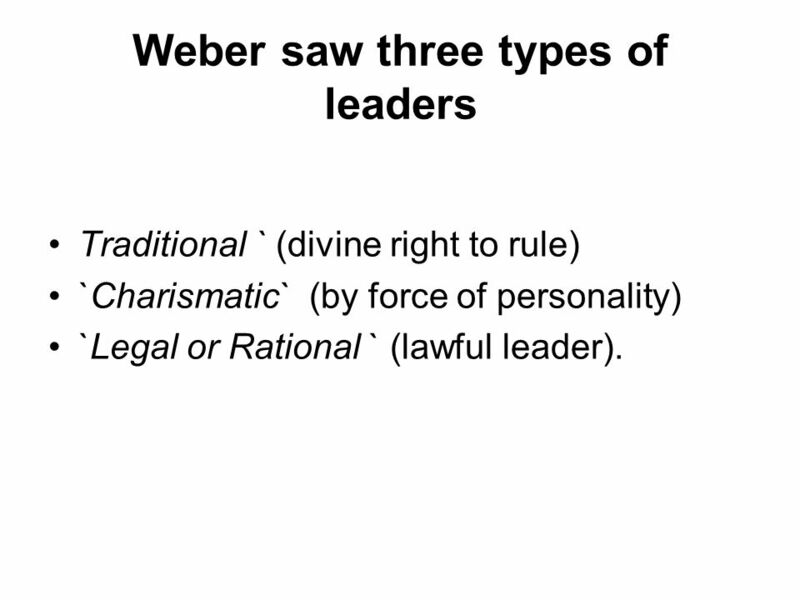 9 Weber saw three types of leaders Traditional ` (divine right to rule) `Charismatic` (by force of personality) `Legal or Rational ` (lawful leader). 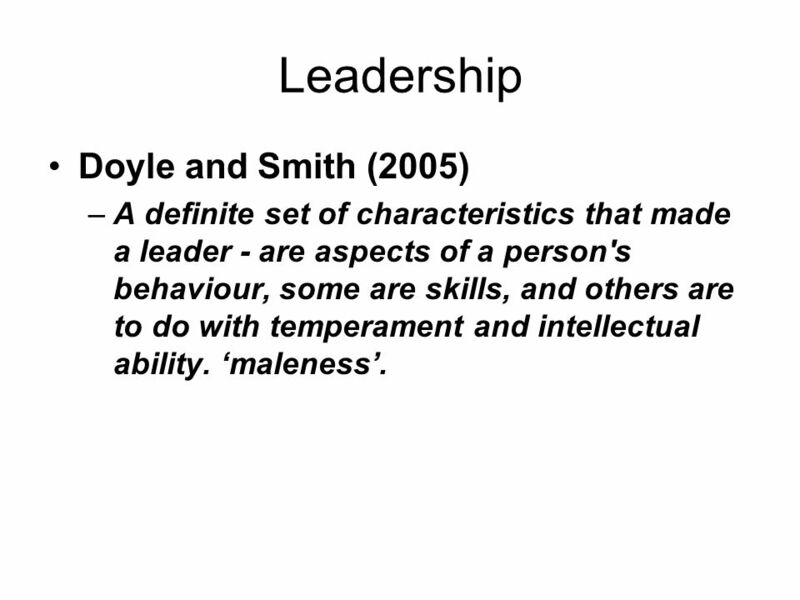 13 Leadership Doyle and Smith (2005) –A definite set of characteristics that made a leader - are aspects of a person's behaviour, some are skills, and others are to do with temperament and intellectual ability. maleness. 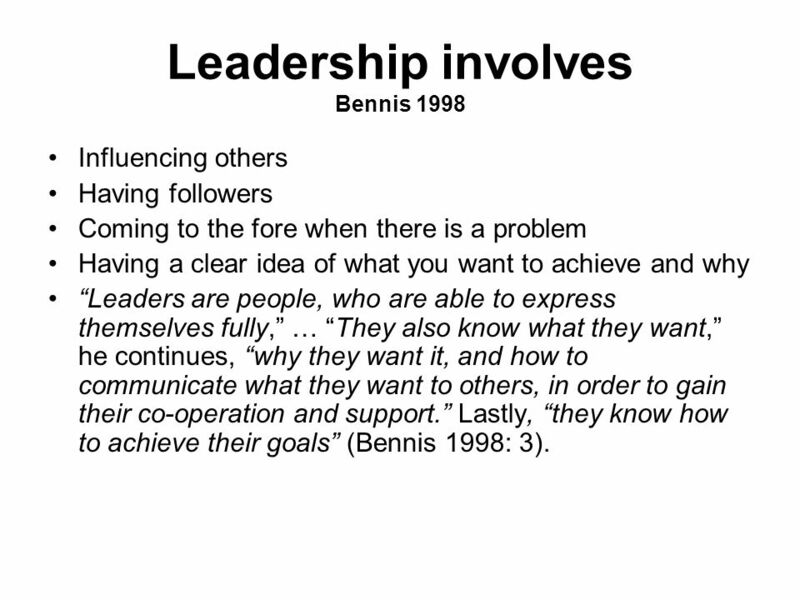 15 Leadership involves Bennis 1998 Influencing others Having followers Coming to the fore when there is a problem Having a clear idea of what you want to achieve and why Leaders are people, who are able to express themselves fully, … They also know what they want, he continues, why they want it, and how to communicate what they want to others, in order to gain their co-operation and support. 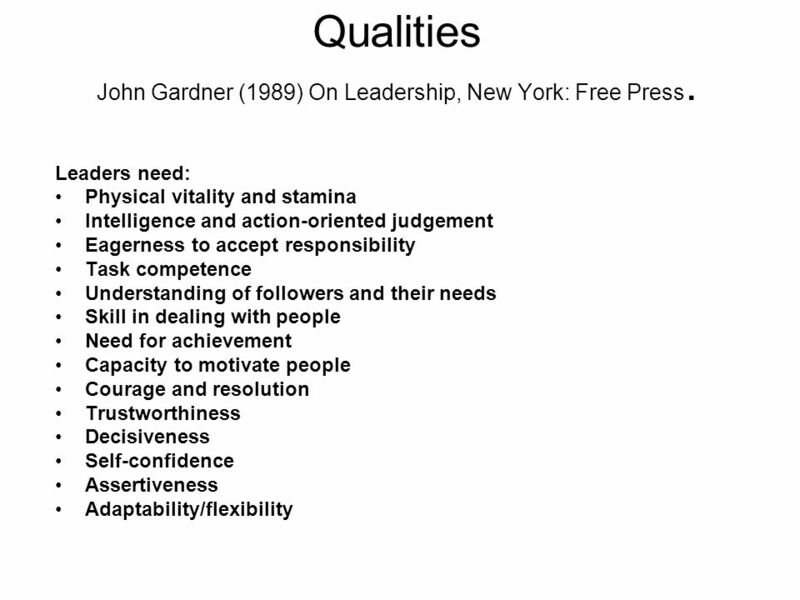 Lastly, they know how to achieve their goals (Bennis 1998: 3). 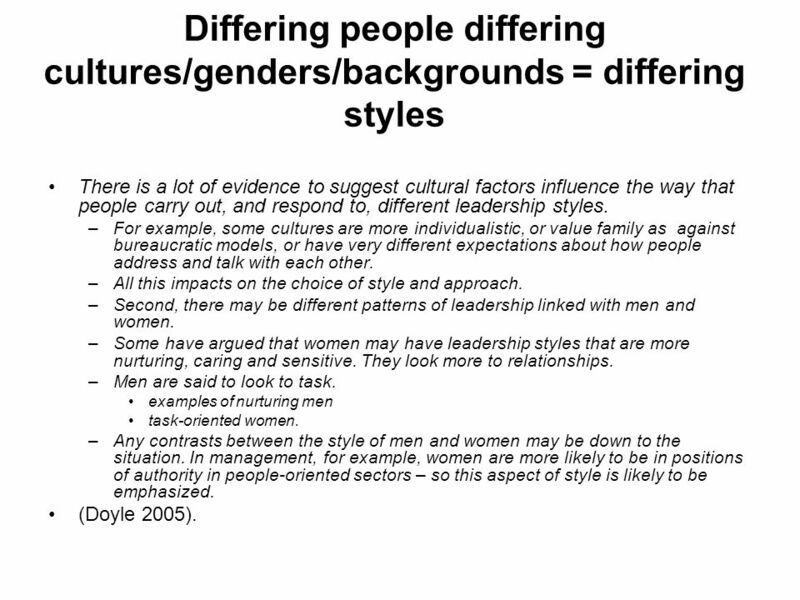 23 Differing people differing cultures/genders/backgrounds = differing styles There is a lot of evidence to suggest cultural factors influence the way that people carry out, and respond to, different leadership styles. –For example, some cultures are more individualistic, or value family as against bureaucratic models, or have very different expectations about how people address and talk with each other. –All this impacts on the choice of style and approach. –Second, there may be different patterns of leadership linked with men and women. –Some have argued that women may have leadership styles that are more nurturing, caring and sensitive. 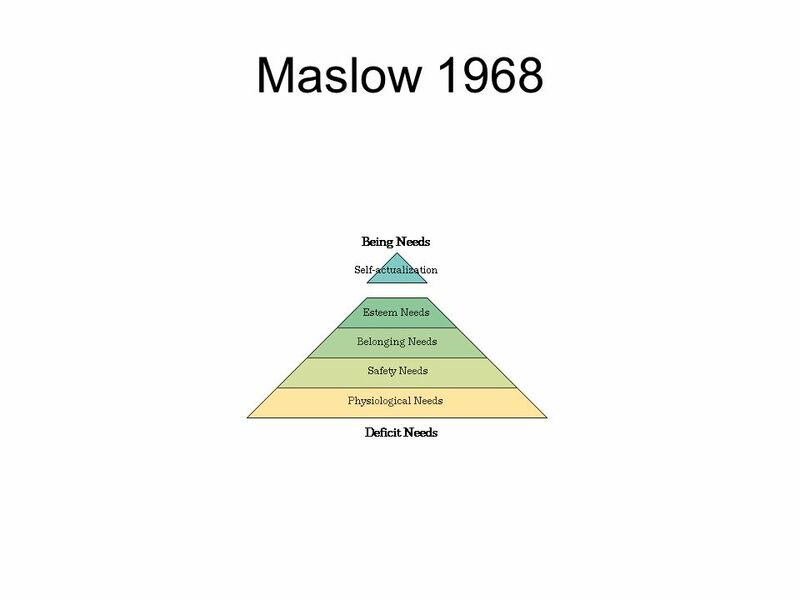 They look more to relationships. –Men are said to look to task. examples of nurturing men task-oriented women. –Any contrasts between the style of men and women may be down to the situation. 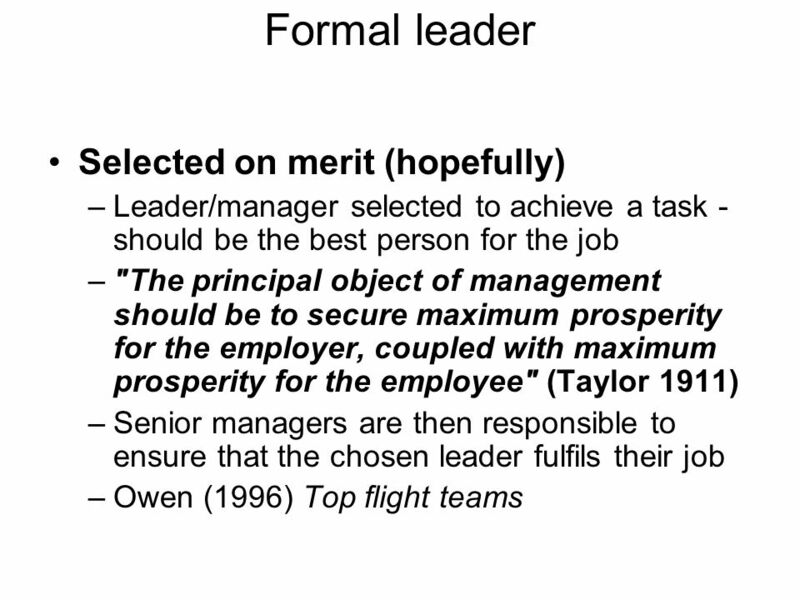 In management, for example, women are more likely to be in positions of authority in people-oriented sectors – so this aspect of style is likely to be emphasized. 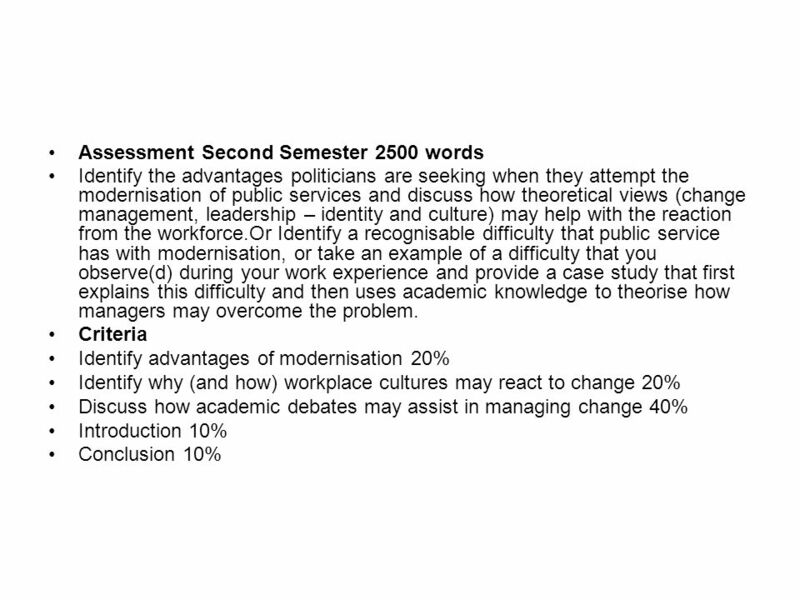 (Doyle 2005). 26 1. 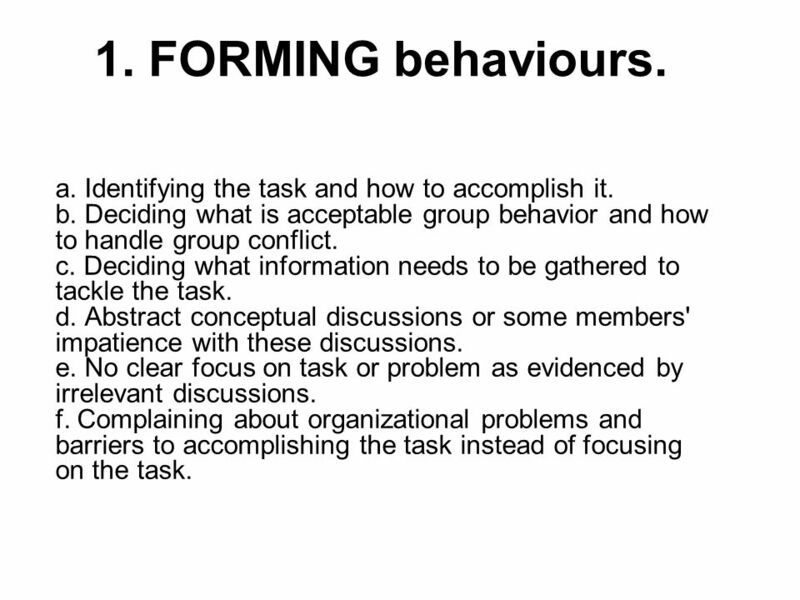 FORMING behaviours. 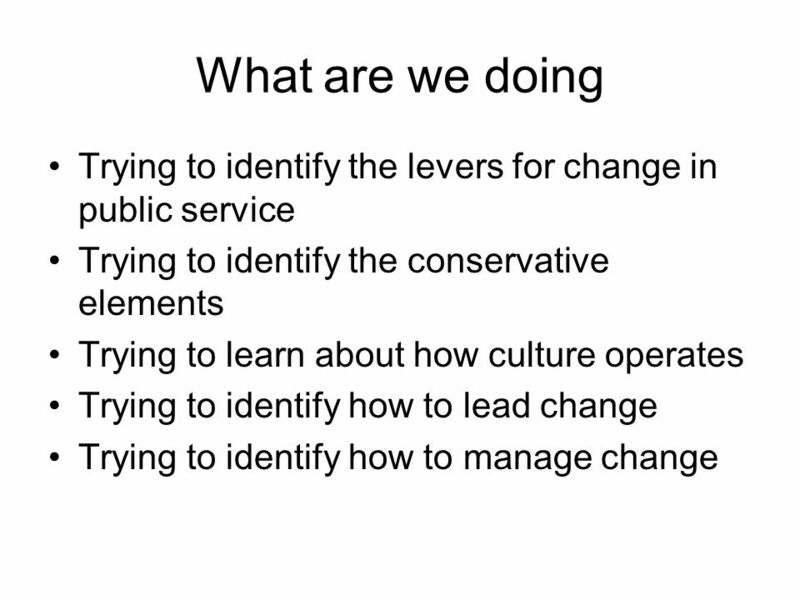 a. Identifying the task and how to accomplish it. b. 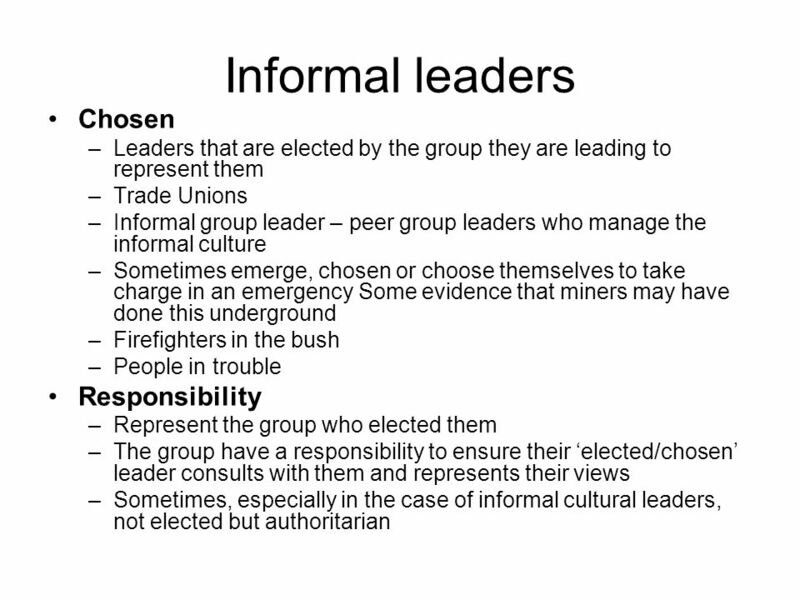 Deciding what is acceptable group behavior and how to handle group conflict. c. Deciding what information needs to be gathered to tackle the task. d. Abstract conceptual discussions or some members' impatience with these discussions. e. No clear focus on task or problem as evidenced by irrelevant discussions. 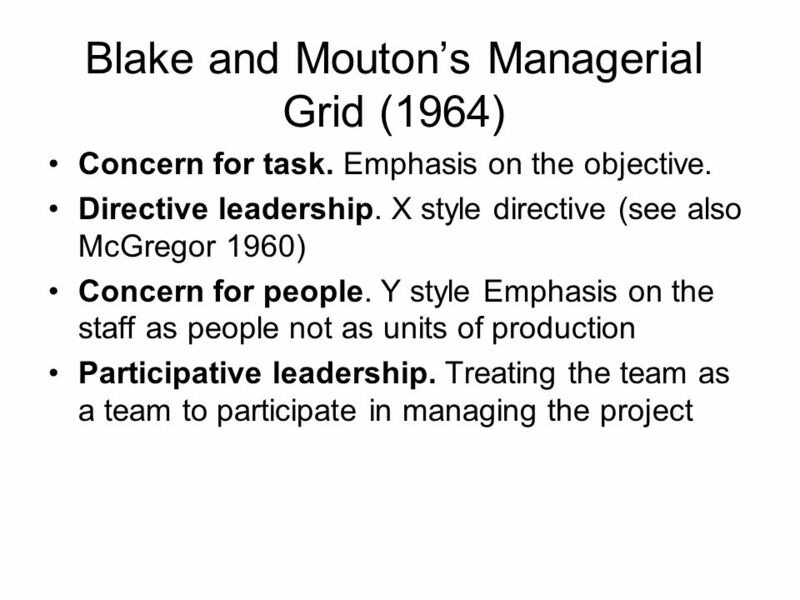 f. Complaining about organizational problems and barriers to accomplishing the task instead of focusing on the task. 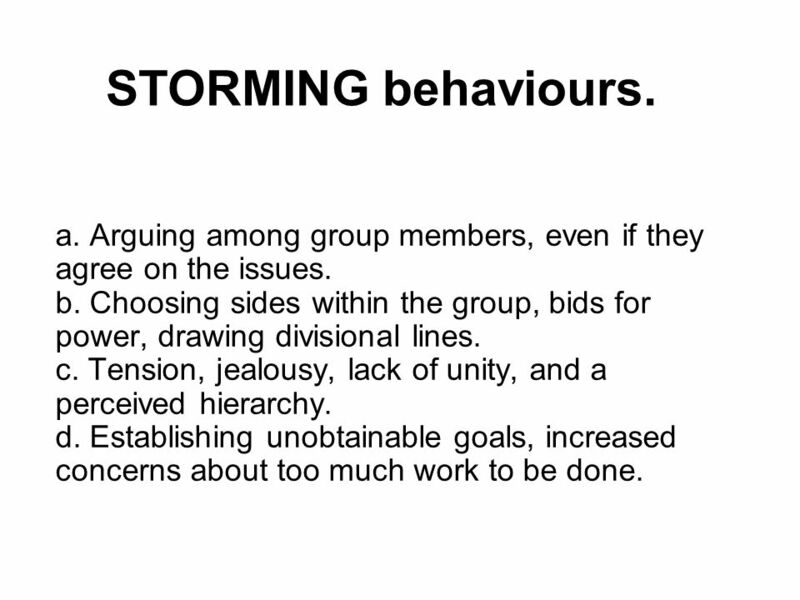 27 STORMING behaviours. a. Arguing among group members, even if they agree on the issues. b. Choosing sides within the group, bids for power, drawing divisional lines. 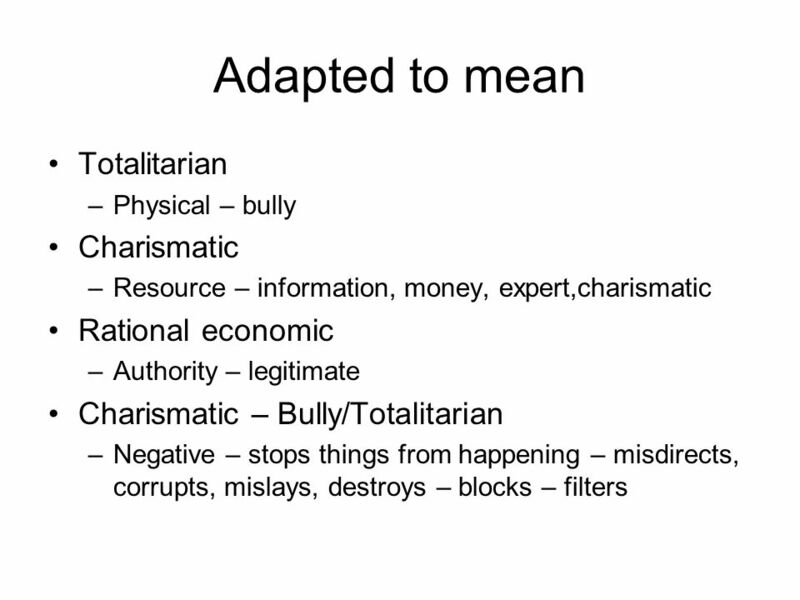 c. Tension, jealousy, lack of unity, and a perceived hierarchy. d. Establishing unobtainable goals, increased concerns about too much work to be done. 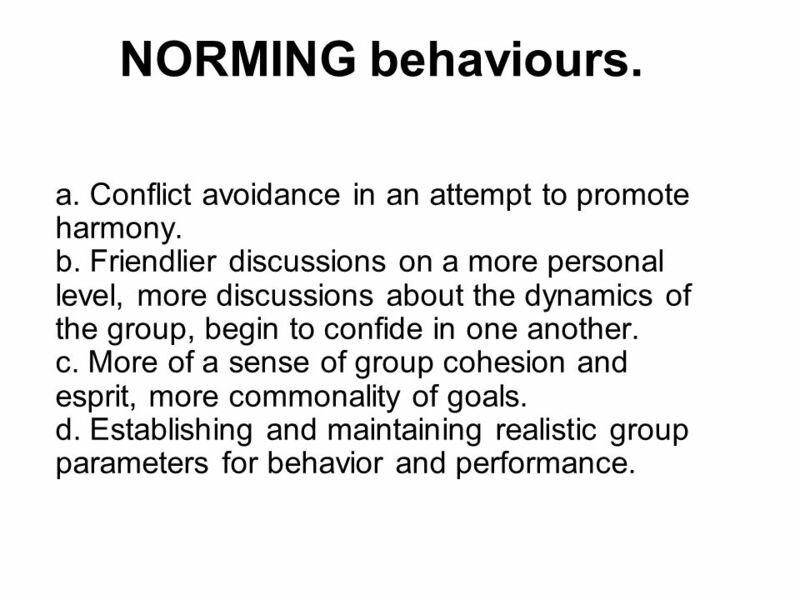 28 NORMING behaviours. a. Conflict avoidance in an attempt to promote harmony. b. Friendlier discussions on a more personal level, more discussions about the dynamics of the group, begin to confide in one another. 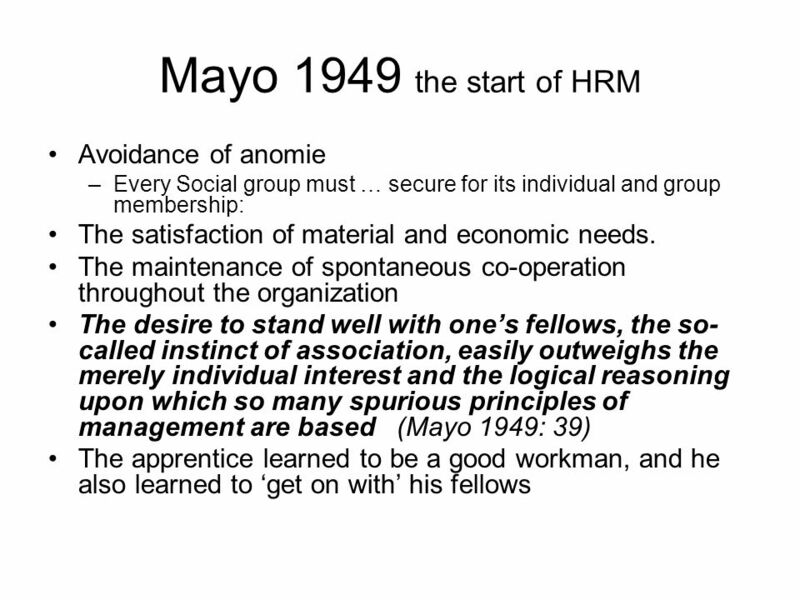 c. More of a sense of group cohesion and esprit, more commonality of goals. d. Establishing and maintaining realistic group parameters for behavior and performance. 29 PERFORMING behaviours. 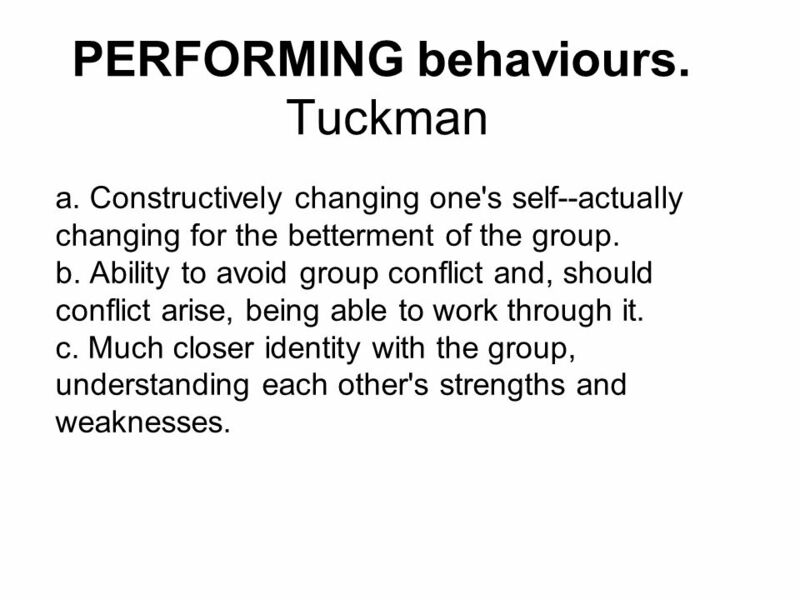 Tuckman a. Constructively changing one's self--actually changing for the betterment of the group. b. 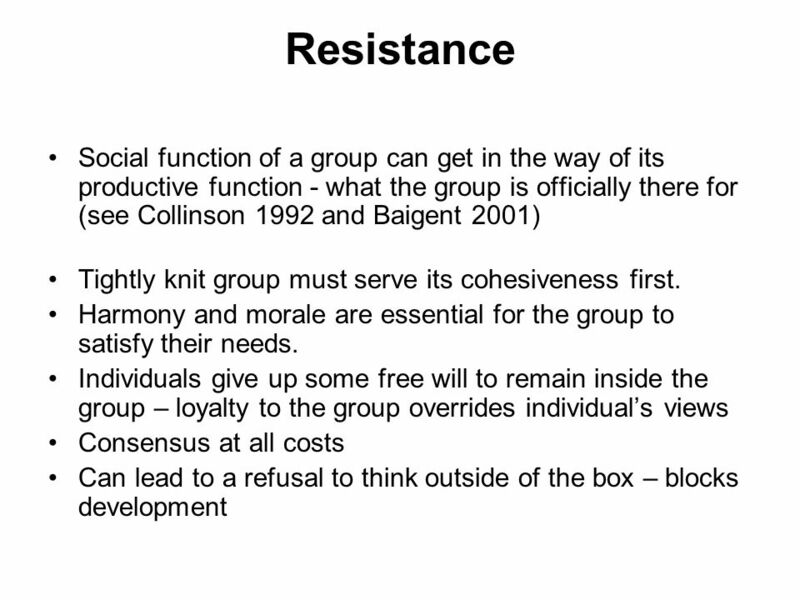 Ability to avoid group conflict and, should conflict arise, being able to work through it. 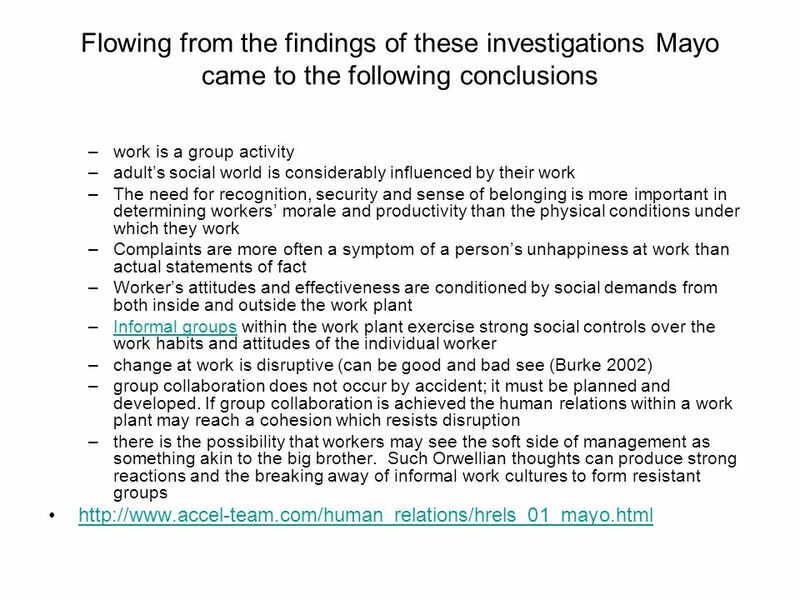 c. Much closer identity with the group, understanding each other's strengths and weaknesses. 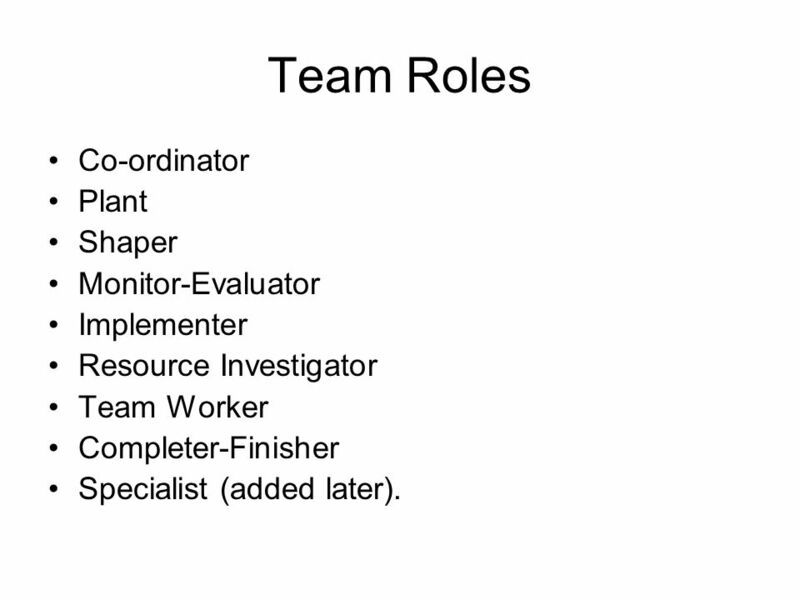 31 Team Roles Co ordinator Plant Shaper Monitor Evaluator Implementer Resource Investigator Team Worker Completer Finisher Specialist (added later). 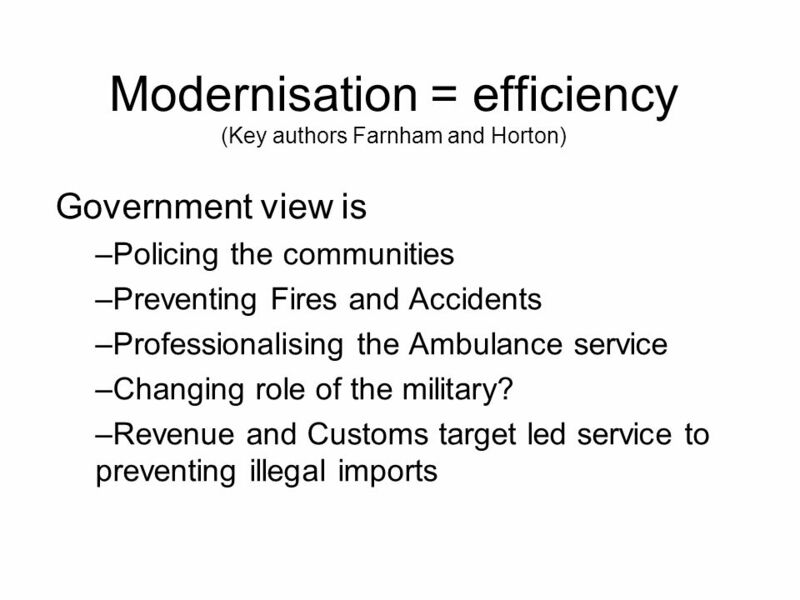 Download ppt "Modernisation = efficiency (Key authors Farnham and Horton) Government view is –Policing the communities –Preventing Fires and Accidents –Professionalising." Adair,J. 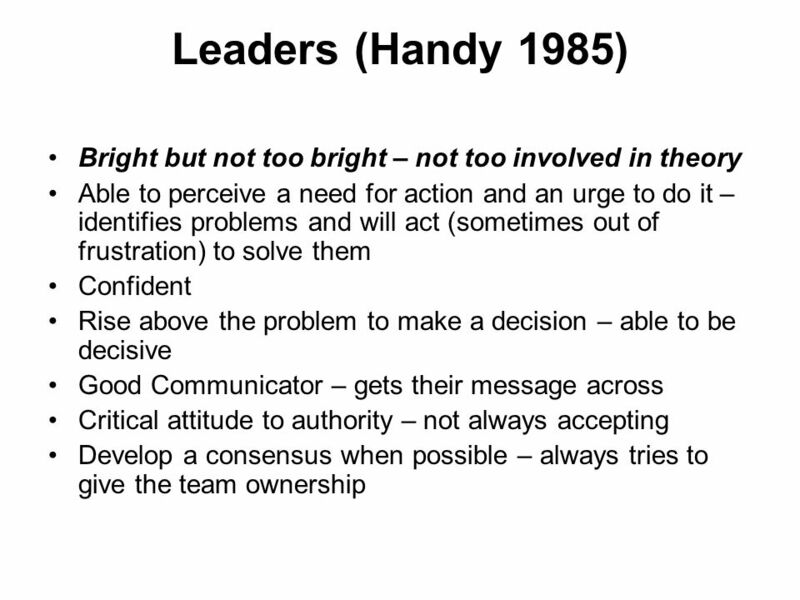 (1993) Effective Leadership, Pan: London. 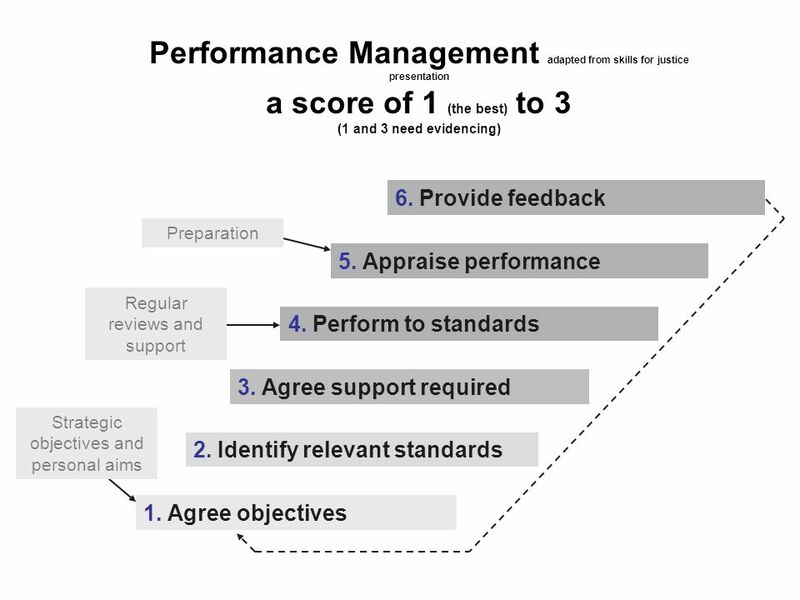 Management, Leadership, & Internal Organization………..
Texas City Municipal Police Association 2012 Satisfaction Survey. 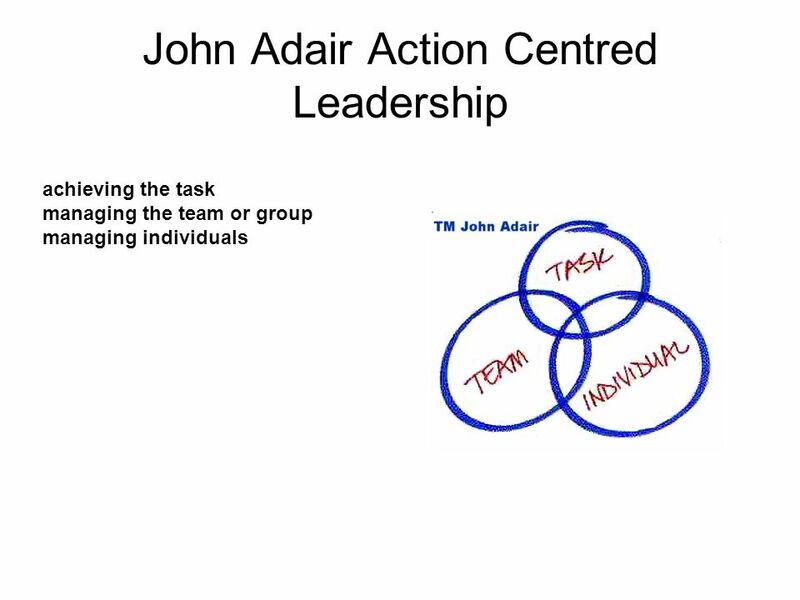 Managerial Skills Creating High Performing Teams. Reveal Course Human Resources & Management of Volunteers Intermediate Level This project has been funded with support from the European Commission. This. 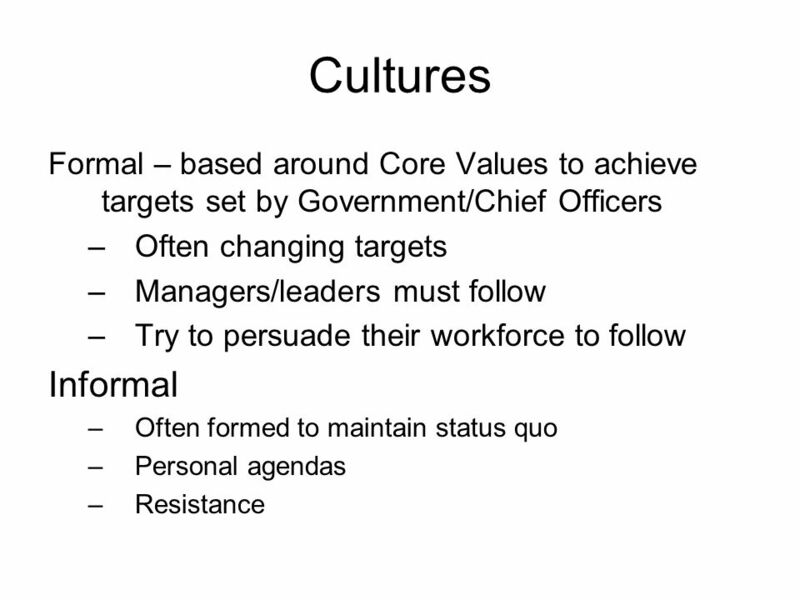 Group 4: Corporate Culture. 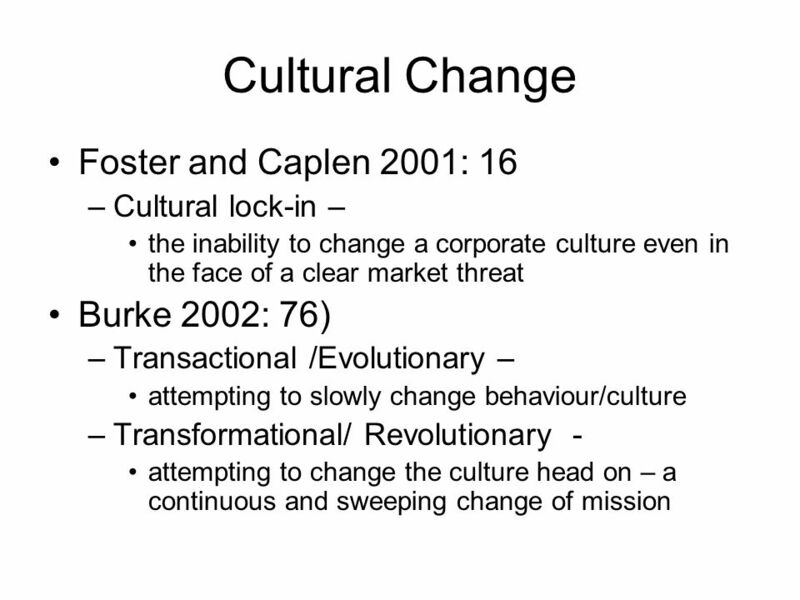 Abstract In this presentation, we will discuss corporate culture In this presentation, we will discuss corporate culture We. Law Enforcement Organization and Administration Chapter 3.